Aero is a very neat feature which has long been a favorite among Windows users since being introduced in windows vista. In Windows 7, Aero has been updated but the built-in customization options are limited. There are a lot of settings available that are not listed in the control panel. 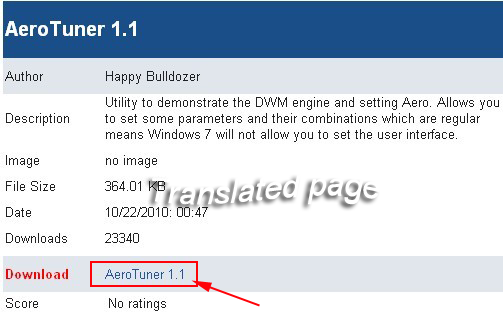 AeroTuner is a portable freeware application for windows 7 aero tuning. It allows you to tweak various Aero theme options which can’t be customized by Windows 7 by default. you can set the two main colors of the Aero window, enable or disable Windows 7 transparency, Customize the color balance, and tweak things like Aero Stripes (which essentially add more of a “reflective” look to Aero windows). Changes are immediately visible in all open windows. 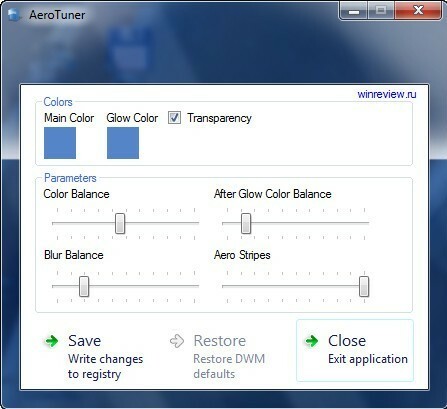 A click on Save changes writes the new settings to the Windows Registry so that they become the new parameters for Windows Aero on the system.If one day you don’t like the changes you have made, you can restore it to defaults so it is safe for you to tweak Aero with this windows 7 Aero Tuner. AeroTuner is avaiable as a free download from this link. AeroTuner comes packaged as a .zip file, you’ll need to extract it to any location on your computer and then you’ll be able to run it.